The introduction of products containing extracts from the Kigelia africana tree to conventional medicine is the result of personal experience with case studies. Sufferers with chronic skin problems, such as psoriasis, can spend most of their lives searching for the Holy Grail, any form of treatment that will give respite from the continual irritation, dryness, flaking skin and redness. So it was with my business colleague, Derek, who has had psoriasis for 45 years, and he became our original case study. Not surprisingly, very little had been documented about the use of sausage trees. The wood of the trees is of little commercial value. Africans in the regions where the trees grow use various parts of the tree for medicinal and also pseudo-medicinal purposes such as hanging the fruit around dwellings as a protection from violent storms and hurricanes or as symbols of fertility. However, the most common uses revealed a similar pharmacological profile. The Tonga apply powdered fruit as a dressing to ulcers. Unripe fruit is used in Central Africa as a dressing for wounds, haemorrhoids and rheumatism. Venereal diseases are commonly treated with the tree extracts usually in palm wine as oral medication. The fruits and bark, ground and boiled in water, are also taken orally or used as an enema in treating children’s stomach ailments – usually worms. 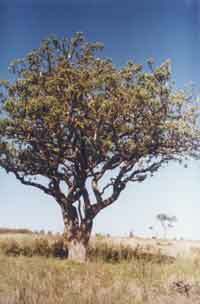 The Shona people tend to use the bark or root as powder or infusion for application to ulcers, drunk or applied in the treatment of pneumonia, as a gargle for toothache, and the leaves in a compound applied for backache. While infections are common, by comparison, skin cancer and psoriasis are far less prevalent among Africans. A breakthrough in my search came when I found some recent published works on laboratory studies which had been conducted at the University of Nigeria in conjunction with Chelsea Pharmacy Department, London., The researchers conducted in-vitro tests for the efficacy of an aqueous extract of stem bark and two major iridoids against Bacillus subtilis, Escherichia coli, Pseudomonas aeruginosa, Staphylococcus aureus and Candida albicans. Their conclusion was that ‘the extract tested had pronounced inhibitory effect against all microorganisms’. These tests gave validity to the traditional use as a natural antibacterial. Chemical analyses of the roots, wood and leaves of the tree have shown the presence of napthoquinones, dihydroisocoumarins, flavonoids and aldehydic iridoid derivatives. 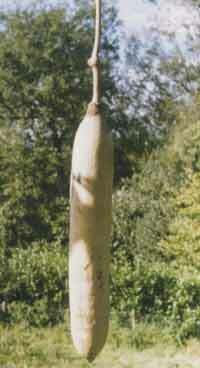 Later work on meroterpinoids and napthoquinones from Kigelia pinnata was an attempt to determine the identity of the antineoplastic constituents. Since psoriasis is a condition where the rate of skin turnover is around seven times faster than normal, a product which might retard overactive cell growth suggested a possible reason for the efficacy Derek had observed. At around the same time, it was becoming generally accepted that an opportunistic mechanism involvingStaphylococcus aureus was a factor in causing outbreaks of atopic eczema. A relative with eczema since birth and in her late forties was recruited. She would experience severe flare-ups on her face at least once a month and the only effective method of control was regular application of one of the strongest steroid creams. Not only had she lived with her condition for so long, but, being in a managerial position in the health food department of a major Central London concern, was well informed about health matters. It took her about three months of regular use with the Kigelia cream before she could discontinue the steroid cream and has now been free of eczema for about three years. Further tests with sufferers of both chronic and acute skin complaints were all encouraging. From our own investigations and those in Africa, we were able to conclude that topical preparations made with the tree extract were well tolerated. In general, users of our creams find them soothing, and one of the first hurdles to overcome with both psoriasis and eczema is to limit the skin damage as a result of scratching. The soothing properties of the cream have been confirmed by medical colleagues in Zimbabwe, who report its effectiveness in treating mosquito bites. A lady recently reported to me that during a visit to the Victoria Falls area she was bitten by tsetse fly. A game warden who accompanied her immediately sliced a piece of sausage tree fruit and applied it to the area for about twenty minutes, after which the bites were hardly noticeable. As a regular traveller to the region, she has also found the cream helpful for removal of her ‘age’ spots.